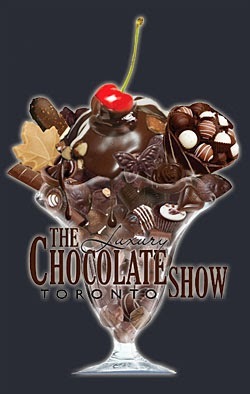 I'm giving away a PAIR of tickets to The Toronto International Luxury Chocolate Show worth $50! The Toronto Chocolate Show is the first and only show of its kind in Toronto to exclusively feature and celebrate everything chocolate under one climate-controlled roof. The third edition of the Toronto International Luxury Chocolate Show celebrates everything chocolate under one roof in a luxuriously appointed venue. A diverse array of fine chocolates and chocolate-inspired products will be featured. Various vendors will be displaying, sampling and selling their fine chocolate products at show prices, just in time for the holiday season! WHERE: Roy Thomson Hall at 60 Simcoe St.
- Admission to The Toronto Luxury Chocolate Show on Sunday, November 3, 2013. - TASTE SAMPLINGS (while quantities last per discretion of each vendor) Does not include wine, cake or savoury food that are available by individual ticket purchase. Contest starts on Monday, October 28th and ends on Thursday, October 31st at 12PM. One lucky winner will be drawn randomly from www.random.org once the contest is over on Thursday, October 31st and I will announce the winner shortly after.